Industrial photography at times requires the use of whatever available tools in an industrial area. To get a better vantage point, one may have to use forklifts, cherry picker, crane and other movable platforms. A major issue in using these devices is safety. The gravity of safety preparation that you need to do depends on how strict your clients are with safety. Safety first. Always think of safety of yourself, yourequipment and those around you. If you are to use a forklift, try to find out if a cage is available; and make use of it. Make sure that the cage is securely fasten to the fork. If there no cage, use a pallet. Same safety measures should be applied. 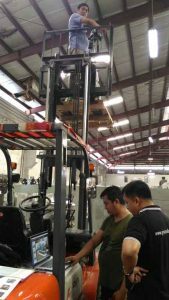 Check if pallet is sturdy enough to support your weight and equipment. Be careful when using wooden pallets. Some are not really that strong. Check if the wood component is sturdy. Secure the pallet to the fork with a rope or a strong vise grip to make sure that it doesn’t fall off while you are shooting. Stay inthe middle of the pallet, and minimise movement. Avoid going on its edges. The pallet may be secure, but don’t challenge it. If you can also secure yourself using a harness. It is easy to forget that you are on a pallet when you are engaged in your photography. Maintain stability. In my case, I make sure nobody touches the whole forklift the moment I click the shutter. Forklift operator should be out, and engine turned off as soon as you have found your correct height. A tiny movement on the forklift gets magnified when you are on top. 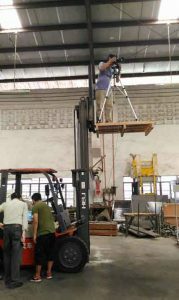 Before you press the shutter, keep absolutely still and allow a few seconds for the forklift to stabilise. Control your breathing as this may affect the stillness. Put your timer to at least 10 seconds for last second stability. If your camera has a Mirror-Lock Up function, use it. Shoot Tethered. Using a long USB cable, my assistant is downstairs on my computer. This step will help you minimise bringing equipment up. If you do not have the luxury of assistants, use your camera monitor. Seek client approval when possible. If client is around, ask him to approve the image. Sometimes, shoots like this can be exacting to specifications. Clients sometimes want to show particular parts that do not look important to you. But may be very important feature in machine. After the shoot. When you have done with your shots, don’t relax yet. Coming down from a forklift is more tricky than going up. Be extra careful with your hands and fingers. Make sure your hands won’t get in between moving parts of the forklift or you lose them. And don’t forget your equipment. Make sure they won’t fall off as you go down. Follow these steps and good luck to your next industrial photography project.